Hot, cool, crunchy and smooth this salad has it all. 1. Preheat the oven to 190˚C, gas mark 5. Put a frying or griddle pan over a high heat until smoking hot. Add the whole chilli and cook for 2-4 minutes, turning with tongs every 30 seconds until blackened in places. Once cooled a little, halve, deseed if liked, then finely chop. 2. Stir together the chilli, chipotle paste, garlic and olive oil; season. Toss the pitta pieces with 2 tbsp of the chilli oil mixture, reserving the rest. Spread out on a large baking tray and toast in the oven for 5 minutes. Stir well and cook for another 6-7 minutes, until crisp and beginning to brown; allow to cool. 3. Add the lemon juice and maple syrup (or honey) to the chilli oil mixture, whisking to form a dressing. 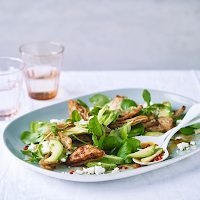 Toss the toasted pitta with the sliced avocado, watercress, feta and dressing. Divide between serving plates and eat before the leaves wilt.